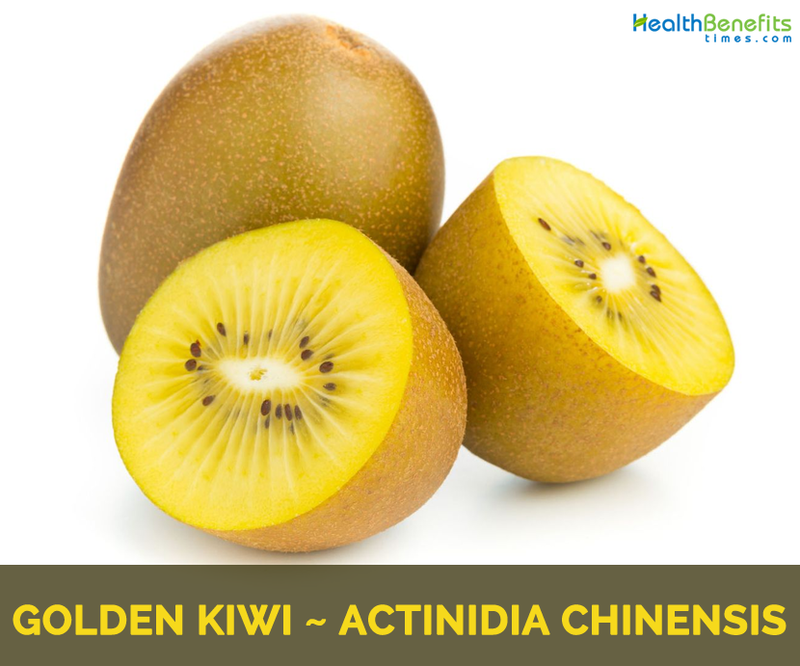 Actinidia Chinensis commonly known as Golden Kiwi is a fruit tree as well as medicinal plant native to China – the central and eastern provinces. The plant belongs to Actinidiaceae (Chinese gooseberry family) and is normally pollinated by bees. 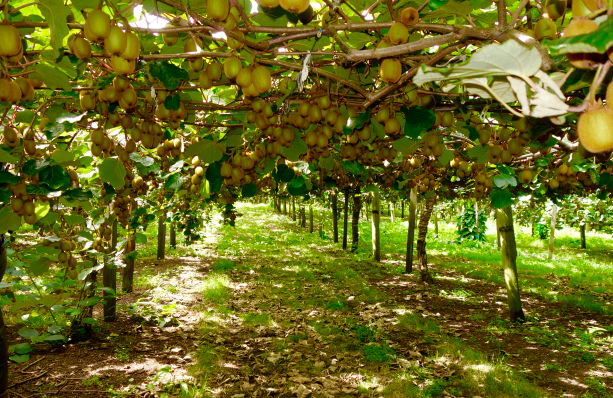 Other popular common names of golden kiwi are Chinese Actinidia, Gold Kiwi Fruit, Kiwifruit, Kiwi Gold, Yellow-Fleshed Actinidia, red-ringed kiwifruit and red kiwifruit. 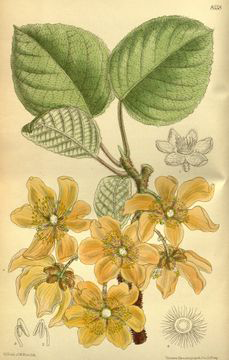 The plant is best known for their edible fruits, though some species are also used as ornamentals, as a source of traditional medicines, and as a stimulant for cats somewhat akin to catnip. 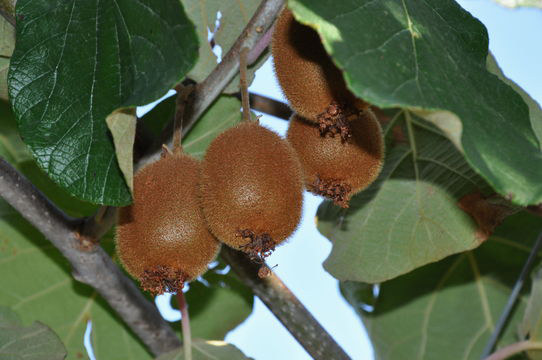 Golden Kiwi is a vigorous, woody, climbing, deciduous, dioecious vine (liana) with white-brown, lamellate pith. The plant normally may reach 10 m in length. 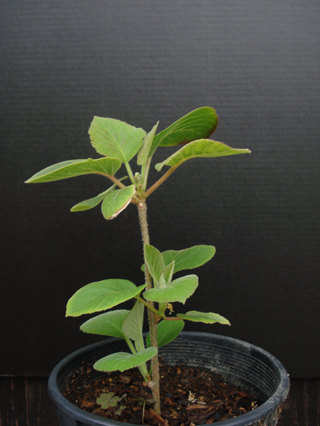 Young branchlets and petioles are white pubescent to roughly tomentose, glabrous when mature or not. The plant is normally found growing in mountain forests, sparse secondary forests, tall grassy thickets on low mountains and thickets and prefers well-drained, moist, fertile soils. Stems are long stout whip-like branches that are green with light orangish brown to white-tan lenticels which tend to lengthen vertically. New stems are covered in a hairy pubescence; second year stems loose most of the pubescence and turn a dark rich smooth glossy brown with white-gray lenticels which may split vertically as the stems thicken. New bark is green quickly turning a rich brown on second and subsequent years’ growth. Intermediate age stems have light gray lenticels that fissure to expose the under bark; stout older trunks become a lighter brown color. Deciduous, alternate, simple leaves are broadly ovate to cordate with rounded or more frequently cordate bases. Leaves are variable in size from 3 inch to 5 inch (8 inch) long; margins are entire, but appear to have almost a yellow hallow due to the covering of short yellowish pubescence when young. Tips are short acute to emarginate, blades are thickish with lightly impressed pinnate veins above, which are more prominently raised beneath and covered in a yellowish pubescence or flushed red on main veins. Petioles are about a third to half the length of the blade, stout, convex above, pubescent and flushed red. Leaves (especially upper surfaces), petioles, and stems become absolutely less pubescent as the season progresses; new growth can be showy. Although flowers are morphologically perfect, they are functionally imperfect; male flowers produce a hundred to two hundred anthers, but only a vestigial stigma. Female flowers produce only a few nonfunctional anthers and radiating styles. Flowers are produced in early to mid-spring from lateral buds in the axis of the first few nodes of the previous year’s elongating stems. 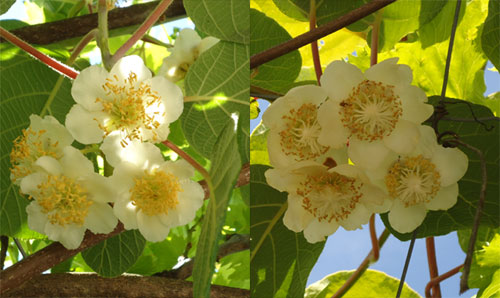 The 1 inch to 2 inch diameter bowl or saucer shaped flowers have five broadly ovate petals which open white and fade to creamy yellow when senescing. Flowers are subtended by fuzzy pubescent light brown bracts with hairy or fringed margins. For good pollen set, one male is required for each three or four female vines and the timing of pollen dispersal needs to be compatible with stigma receptivity; compatible pollinators, as well as suitable pollinizers, need to be identified. Flowers are subtended by long yellow-green peduncles that may be flushed red. The plant later produces oblong to egg-shaped, 3inch long, berry-like fruit that are produced in abundance on female vines. Fruits have greenish brown skin densely covered with short hairs. Skin is paper like thin. 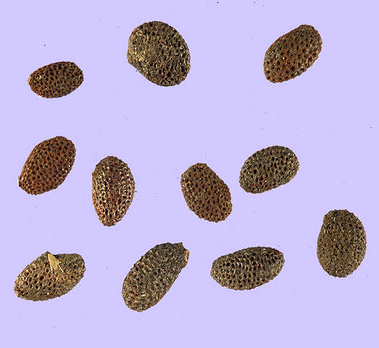 Flesh is either green or golden-yellow containing many hundreds of tiny black seeds. One fruit normally weights about 70 -140 g. Fruit mature in late summer to early fall. 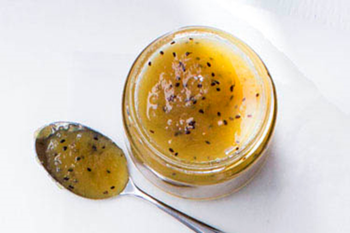 There are plenty of health benefits of the golden kiwi. In order to better inform the average public, here is the list of some popular reasons why golden kiwis are awesome for your health. Kiwi fruit consists of ample water content, which has made it one of the best alternatives to satisfy thirst. During long and tiring days where it is loaded with various activities, kiwis can be the substitute to beverages the same way as how chestnut fruits work. Dehydration can be anticipated at its best and your body will return to its most fit state. High blood pressure or hypertension is one dangerous disease nowadays. The disease is so dangerous to the point that death caused by it gets common. Apart from yellow melons, yellow kiwis can as well avoid the existence or relapse of hypertension when consumed regularly. If you had just consumed a food item that has the potential to initiate or aggravate hypertension to appear, it is best to consume golden kiwis right away to neutralize your body. Macular degeneration, which is actually the damage of the retina’s central component, causes vision loss, and kiwis have the power to protect your eyes from damaging. According to this article, consuming three servings of golden kiwi per day can reduce the risk of macular degeneration by up to 36%. Golden Kiwis help to improve the flow inside the blood arteries by saving the blood cells from clotting, which is why kiwis are considered superb for patients who are suffering from problems related to the blockage of blood vessels. You can consume kiwis either by cutting it into slices, or make it into a refreshing juice, whichever way you prefer. Diabetes affects the whole health system as a whole. Yellow kiwis help to anticipate the likelihood of diabetes approximately the same way as how spinach stems do it. Not only is it acidic, yellow kiwis also turning out to have lower saturated fat content. You can finally say goodbye to high blood sugar content that leads to diabetes. The DNA’s condition can also be well maintained through the consumption of yellow kiwis. The consumption of kiwis completes your vitamin and mineral requirements so that the DNA network continues to be under prime condition and it goes on for the upcoming cycles. 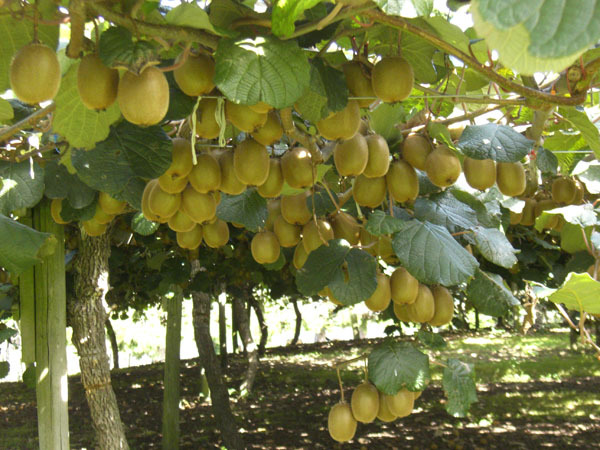 There are many health benefits of golden kiwi fruit. 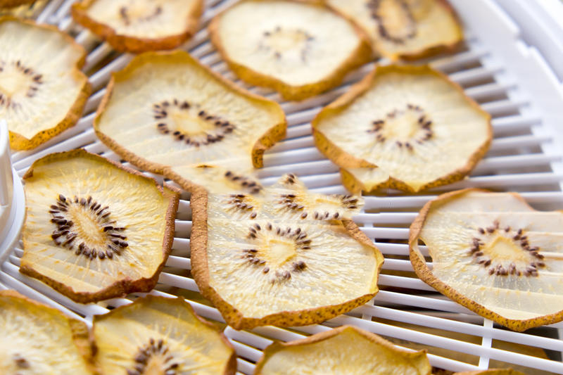 Yellow kiwis consist of fibers and water that are much desirable for the digestive system. Regular consumption of yellow kiwi takes good care of the digestive system, the same way senna leaves handle it. Healthy digestive system is the key to decrease the risk of various digestive infections. 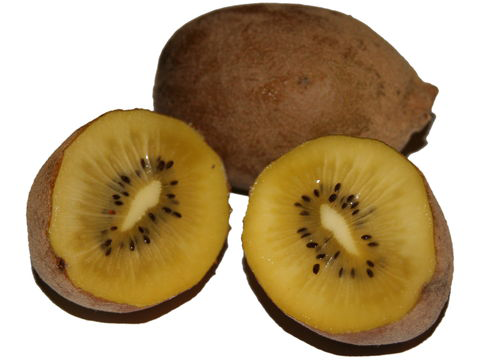 Golden kiwis have sour taste, and it is much suggested for anyone undergoing a diet program. Kiwi does not make you gain weight, but instead it fulfills your vitamin and body liquid needs. Make Golden kiwis the main staple to your diet program, and then convenience throughout the whole program will come to you. 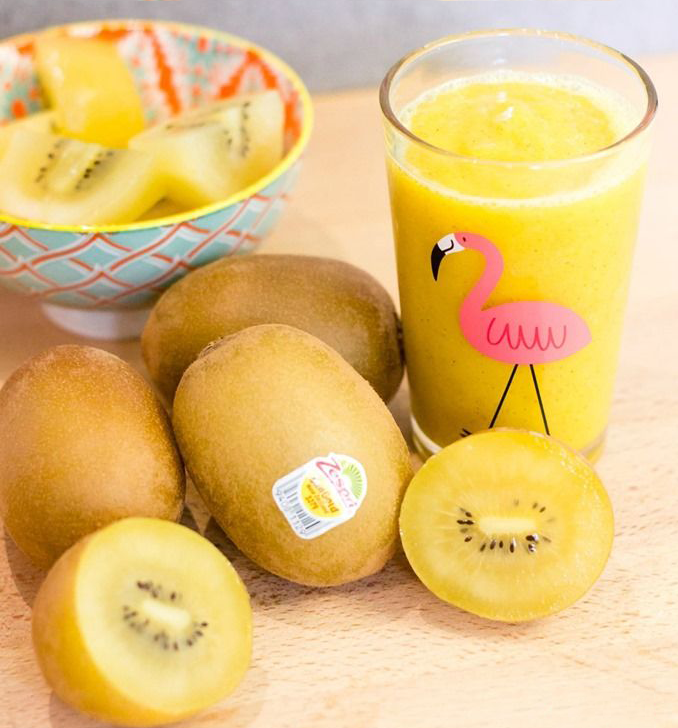 Golden kiwis are well-known to have plenty of vitamin C content, which helps the maintenance of body cells so that cancerous cells don’t come out as quick. That is why yellow kiwis are wonderful to avoid the rapid distribution of cancer cells. Heart health can be guaranteed through the regular consumption of yellow kiwis. It is indeed highly recommended because its water-heavy texture lightens the heart’s workload in pumping blood. Consume golden kiwis regularly so that the heart’s health gets well assured without the risk of any coronary diseases. Rich composition of vitamin C and antioxidants inside a golden kiwi treats asthma patients better. A 2000 research discovers that regular consumption of other fruits, which include kiwi, creates a positive effect on the lung functions. Among children, kiwis also reduce the occurrence of wheezing. Fruits, stems and roots are diuretic, febrifuge and sedative. They are used in the treatment of stones in the urinary tract, rheumatoid arthralgia, cancers of the liver and esophagus. Decoction of the leaves is used to treat mange in dogs. Stem-juice is used in the treatment of gravel. Kiwi fruit is a cure for Insomnia. It improves the quality and duration of sleep. Eating 1 to 2 Kiwi fruits before bedtime is recommended for a person with Sleep disorder. High amount of antioxidants present in the Kiwi fruit fights against the free radicals. It prevents the damage to the DNA cells which may cause Inflammation and Cancer. It improves the functioning of the Immune system and increases the resistance in combating Infections. 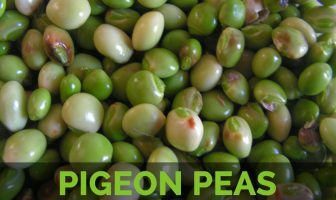 Its regular consumption provides relief from Constipation. It curbs the problems like Stomach Pain, Diarrhea, and Irritable Bowel Syndrome. Kiwi fruit contains eye protective Carotenoids like Lutein and Zeaxanthin. These prevent the occurrence of Cataract and Macular Degeneration. Kiwi fruit is good for skin health. It protects the skin from sun damage. It improves the skin complexion and prevents the occurrence of Wrinkles. It rejuvenates the damaged skin and makes the skin look younger and glowing. The presence of Potassium in the Kiwi fruit regulates the Blood Pressure. It counters the ill effects of excessive sodium and maintains a balance of electrolytes in the body. Kiwi fruit promotes Heart health. The richness of Fiber regulates the level of Cholesterol in the blood. It prevents the occurrence of Heart Attack and Stroke. It cures the problem of Irregular Heartbeat. Kiwi fruit being low in calories is an ideal fruit for weight loss. It prevents the shortness of breath and boosts the functioning of the Respiratory System. It is helpful in treating Lung inflammation. It provides relief in Respiratory Problems like Asthma, Cough and Wheezing. Immune Booster: Add 2 cut Kiwi Fruits with 1 Lemon, some leaves of Parsley, 2 to 3 leaves of Mint and a half teaspoon of Honey into a half glass of water, Blend all together. Drink this mixture daily. This healthy juice will enhance your immunity. Obesity: Blend 2 leaves of Mint, some fresh leaves of Parsley, a half teaspoon of Honey, half Lemon and 2 Kiwi Fruits with a glass of fresh water. Daily intake of this juice will help you in reducing your weight. Fruit pulp is sweet, juicy and nutritious. It is used and processed the same way as for Actinidia deliciosa and Actinida arguata. Pulp is more agreeable to processing because of its yellow colored flesh whereas the chlorophyll-based green color pulp of A. deliciosa tends to change to brown on processing. 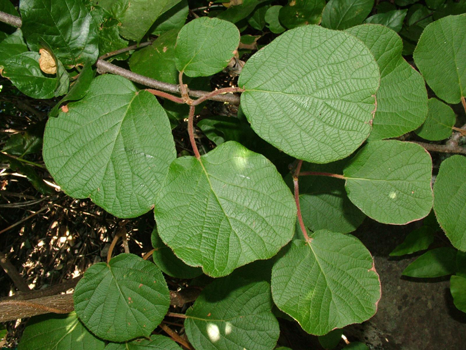 Leaves are eaten cooked in times of need as a famine food. Paper is made from the bark. If the bark is removed in one piece from near the root and placed in hot ashes, it becomes very hard and can be used as a tube for a pencil. Plant is said to have insecticidal properties (no more details). Flower Male flowers produce a hundred to two hundred anthers, but only a vestigial stigma. Female flowers produce only a few nonfunctional anthers and radiating styles. Flavor/Aroma More aromatic in flavor; its flavor is reminiscent of some sub-tropical fruit. It may cause allergic reactions such as vomiting and hives.